As promised, I wanted to show you some progress on my Kaffe quilt! I just love how it is turning out, although I am not too far into the process. But I am just glad to be sewing and not unsewing!! 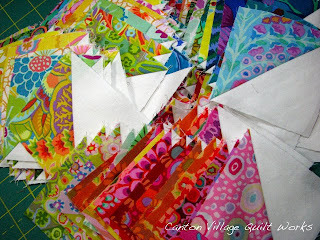 So I started out by cutting all those fabrics you saw here into triangles with my AccuQuilt Studio cutter. Love that thing!! See all the corners are trimmed off, makes for perfect matching. 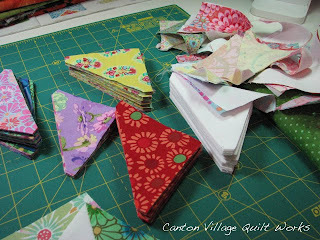 You can see 2 HST trial blocks before beginning to sew all the rest. 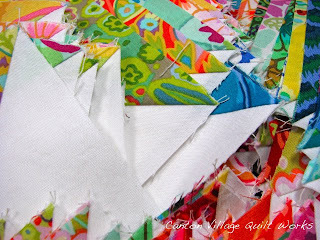 Whittling away at the massive pile of triangles felt so good! Had to show you a close up of those really pretty Kaffe's. Love them!! 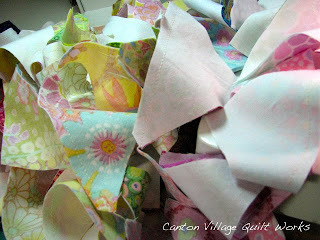 I also love how they look in the chain pieced pile. Don't you? Here are all the HSTs all sewed together and pressed open. Now onto to the layout! The layout will be on the plan for this week. 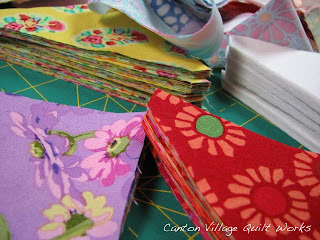 I think I will be making two quilts from these blocks. I have plenty and I have 2 layouts in my head. All of your suggestions were terrific and everyone was appreciated. As you can see, I went with white Kona. Love the nice contrast! On another note, I have been busy loading customer quilts in my gallery. Check them out! I have also added some Kaffe die cut circles and tumblers to my Etsy shop! 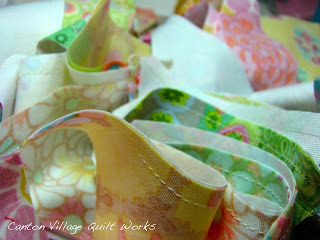 Some of the fabrics were the same ones that I used for the quilt in progress. 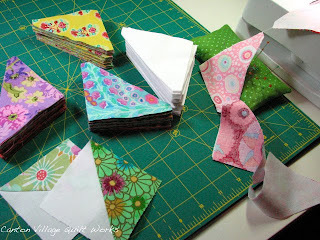 I have also been busy die cutting different shapes of 1930s fabrics, which you can also find on my Etsy shop. Thank you all who have visited my shop and are helping to make it a success! I really appreciate it!